Home » Cheryl's Shoebox Blog » The JG Group Delivers with Tacos and Shoes! The JG Group Delivers with Tacos and Shoes! A big thank you to Julie Guerrero, Dean McConkey and the entire team at The JG Group: Vallarta Real Estate Advisors for choosing Cheryl’s Shoebox as the recipient of donations for their fabulous Taco & Cocktail Party celebrating the arrival of the Atlantis Cruise Ship on October 17th. 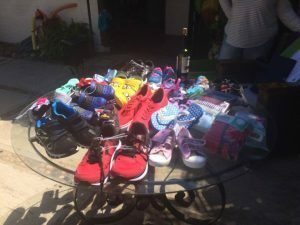 Guest were encouraged to donate shoes and underwear while enjoying amazing tacos & live music. A cash donation of $150 dollars, underwear for out Progresso/ Perota student project, tennis shoes for El Colorado school and shoes for the Banderas Bay Women’s Shelter were donated that evening. Just a reminder its easy to encourage your guests to donate to any of your favorite Puerto Vallarta charities over the upcoming holiday season. Thank you Julie and Dean for a great party and thinking of us as you celebrate.